Michael Fedderke, "Studies in Higgs physics, particle dark matter and early universe"
"Michael's thesis work covers several important aspects of particle physics and cosmology. It includes detailed studies on the signal of dark matter annihilation in the galactic halo. After producing an interesting paper on the heavy particle production in the early universe, he delved into Higgs physics. He evaluated the potential of discovering new physics via fermionic Higgs portal, which has implications for the physics reach of both current and future colliders. In his most recent project, he has also constructed a model which addressed the little hierarchy problem in the composite Higgs scenario using cosmological evolution of an axion like field." Hsin-Yu Chen, "Multi-messenger Astronomy with Advanced LIGO-Virgo"
"Hsin-Yu's work is helping set the stage for the new era of gravitational-wave astronomy. She has played an active role within the LIGO collaboration in the analysis of our first detections, while also becoming a leader in the field of multi-messenger astronomy." Thesis Abstract: My thesis is focused on gravitational wave multi-messenger astronomy. 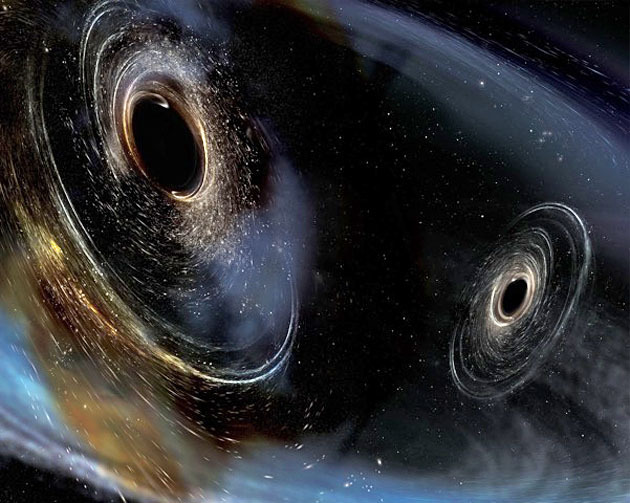 The most promising sources for current gravitational wave detectors are compact binary mergers, including the mergers of stellar mass binary black holes, binary neutron stars, and neutron star-black hole system. I investigated the detection rate of binary neutron star and neutron star-black hole mergers from observations of their potential electromagnetic emission. To facilitate the search for the electromagnetic counterparts and the host galaxies of compact binaries, I developed a rapid algorithm that reconstructs the sky direction and luminosity distance of binary mergers from their gravitational wave signals, and predicted the existence of well-localized events. In addition, I carried out a thorough study of how gravitational-wave observational selection effects influence electromagnetic follow-up. In summary, I explored how to measure astrophysical and cosmological parameters with gravitational wave detections, and facilitated gravitational wave-electromagnetic follow-up through various approaches, paving the way for the future of gravitational wave astrophysics and cosmology. Chen He Heinrich, "Lensing Bias to CMB Polarization Measurements of Compensated Isocurvature Perturbations"
Ph.D. Committee members: Daniel Holz, Abigail Vieregg, Liantao Wang. Thesis Abstract: Compensated isocurvature perturbations (CIPs) are opposite spatial fluctuations in the baryon and dark matter (DM) densities. They arise in the curvaton model and some models of baryogenesis. While the gravitational effects of baryon fluctuations are compensated by those of DM, leaving no observable impacts on the cosmic microwave background (CMB) at first order, the baryon fluctuations correlate CMB anisotropies at different multipoles. As a result, CIPs can be reconstructed using quadratic estimators similarly to CMB detection of gravitational lensing. Because of these similarities, however, the CIP estimators are biased with lensing contributions that must be subtracted. In this work, we evaluate these lensing contributions and their impact on the CIP detection threshold due to lensing noise, and assess the prospect of detecting the maximal CIP signal in the curvaton model for a cosmic-variance-limited (CVL) temperature and polarization experiment. Laura M Mocanu, "Measuring the cosmic microwave background gravitational lensing potential and its power spectrum with SPTpol"
Ph.D. Committee members: Scott Dodelson, Brad Benson, Abigail Vieregg. "Monica has make many important contributions to the analysis of South Pole Telescope CMB data. For her thesis she has used SPTpol temperature and polarization data to produce the most sensitive CMB lensing reconstruction of the mass distribution in the universe, paving the wave for SPT-BICEP B-mode delensing and other cosmological analysis." Thesis Abstract: Weak gravitational lensing by large-scale structure in the universe causes deflections in the paths of cosmic microwave background (CMB) photons. 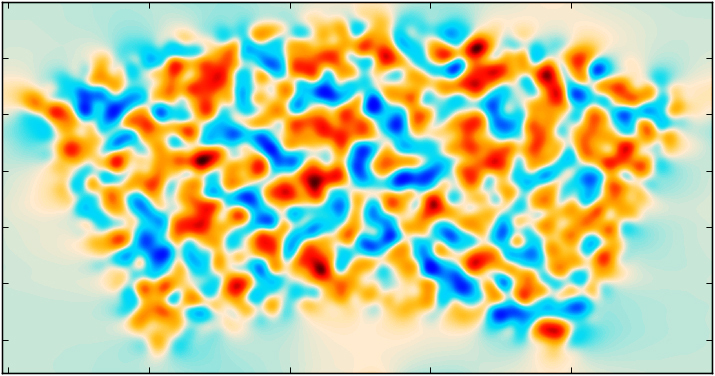 This effect introduces non-Gaussian correlations in the observed CMB temperature and polarization fields. The signature of lensing can be used to reconstruct the projected gravitational lensing potential with a quadratic estimator technique; this provides a measure of the integrated mass distribution out to the surface of last scattering. The power spectrum of the lensing potential encodes information about the geometry of the universe and the growth of structure and can be used to place constraints on the sum of neutrino masses and dark energy. High signal-to-noise mass maps from CMB lensing are also powerful for cross-correlating with other tracers of large-scale structure and for delensing the CMB in search for primordial gravitational waves. In my thesis, I describe a measurement of the CMB gravitational lensing potential and its power spectrum using data from 500 square degrees of sky observed with the polarization-sensitive receiver installed on the South Pole Telescope, SPTpol. Alessandro Manzotti, "Unveiling the early Universe: delensing the Cosmic Microwave Background with galaxy surveys"
"Alessandro led the team that carried out the first 'de-lensing' of the polarization in the cosmic microwave background. Using data from the South Pole Telescope, the team used software to undo what billions of years of propagation through the clumpy universe has done: distorted the pattern of polarization. This first demonstration is the harbinger of what will ultimately become an essential tool in analyses of future SPT CMB-Stage 4 data." 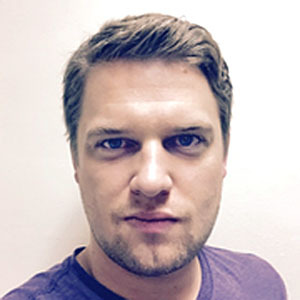 Michael Florian, "Measurements of Morphology in Strongly Lensed Galaxies in the Image Plane"
"Michael has been working at the interface of simulations and observations to develop statistical methods to quantify the morphology of strongly lensed galaxies, in the image plane. Such techniques bypass the extensive effort (both in analysis, and additional data) required to model strong lensing systems and generate source plane images. His work in particular sets a standard for upcoming space missions such as JWST, Euclid and WFIRST; he will be leaving us to go to take a NASA Postdoctoral Fellowship working the JWST group at Goddard Space Flight Center." Bjorn Scholz, "First Observation of Coherent Elastic Neutrino-Nucleus Scattering"
"Bjorn's thesis contains a much coveted result in neutrino physics, the first observation of coherent neutrino-nucleus scattering. Bjorn performed an exquisitely careful detector calibration and analysis of the data, resulting in the extraction of just a couple of hundred events, in near-perfect agreement with the Standard Model predictions for this process. Bjorn's thesis marks the starting point of a new area of activity within neutrino physics, one that may lead to exciting discoveries." Thesis Abstract: Coherent elastic neutrino-nucleus scattering (CEvNS) has the largest predicted cross-section of all low-energy neutrino couplings. However, as a neutral-current interaction, the only experimental signature of CEvNS is a low-energy nuclear recoil, which made its detection challenging. CEvNS remained unobserved for over four decades. I will describe the experiment that resulted in a CEvNS observation at a 6.7-sigma confidence level, which was performed in the framework of the COHERENT collaboration. 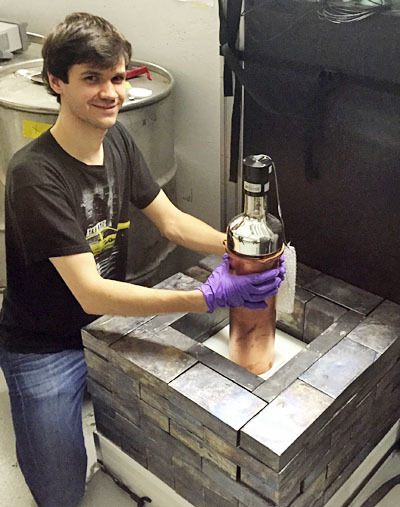 A low-background, 14.6-kg CsI[Na] scintillator was exposed to the neutrino emissions from the Spallation Neutron Source at Oak Ridge National Laboratory. 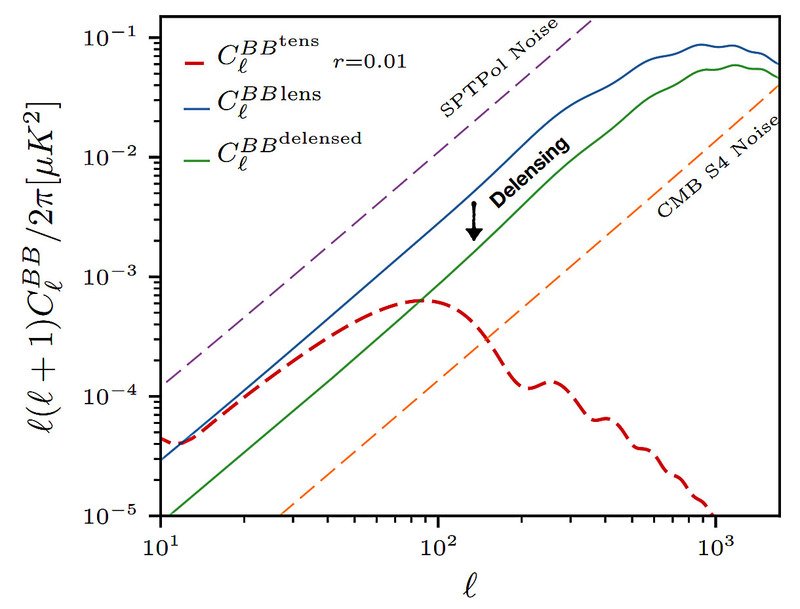 Characteristic CEvNS signatures in energy and time, compatible with predictions from the Standard Model, were observed in high signal-to-background conditions. CEvNS provides new opportunities to study neutrino properties, and enables the miniaturization of detectors.